WATCH: 10 Injured After Lag BaOmer Fire EXPLODES In Stamford Hill, Was It Caused By Fuel Or A Smartphone? 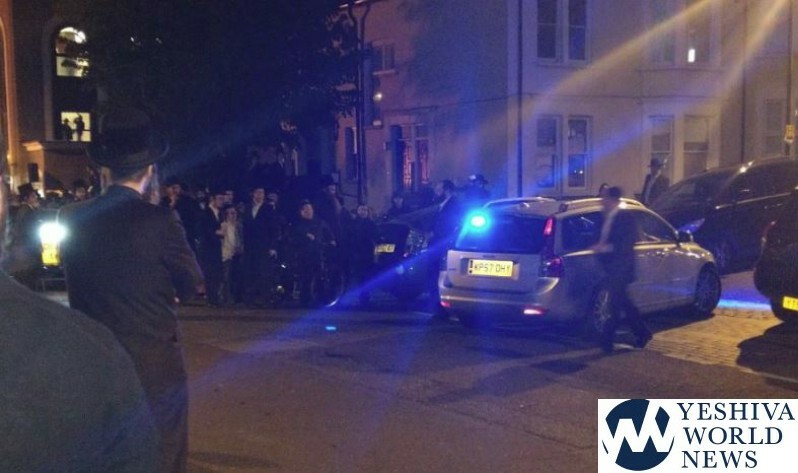 A Lag baOmer celebration in London went terribly wrong on Wednesday night. Hundreds of people had gathered at the Biala Shul in Stamford Hill, as the Rebbe was going to light the “Medurah”. The music began to play slowly as a small fire was being ignited on a pole – which would then be used to light the bonfire – which was soaked in oil. As can be seen on the shocking footage below, the second the fire was lit on the pole, there was a massive explosion and large fireball. People shrieked and panicked, and people trampled on one another. 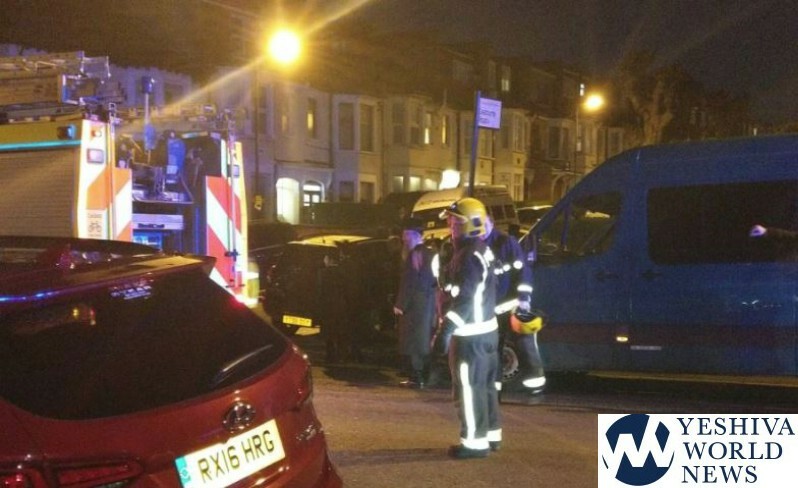 Hatzola rushed to the scene, and treated around 30 people. Approximately 10 people were taken to the hospital, many with burns on their faces. Social media erupted with reports that a smartphone was burned which caused the explosion. 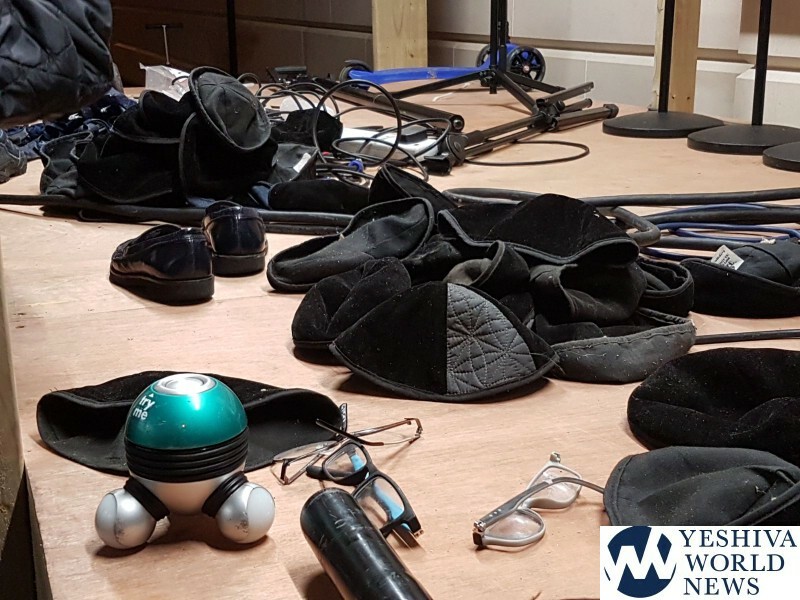 YWN spoke with multiple eye-witnesses that confirmed that the Rebbe did in fact give a speech about the dangers of smartphones and that he would be burning one. In fact, he gave the same speech last year. It appears that the explosion was caused by fuel and not the smartphone, although there definitely were multiple smartphones placed inside the pile to be burned. Apparently it was caused by fuel, not a smartphone, as the fire was burning for less than a second when the explosion occurred. Not entirely clear from the video but it seems that some basic safety precautions were not followed. The lighting pole seems to be right next to the madura. The main purpose of the pole is to keep a distance from the fire. There should also be a mandatory safe perimeter around the fire enforced with gates. All the injured should have a Refuah Shlaimah. The only explosive part of a smartphone is the battery. You can see youtube videos of people that had their smartphone explode, some weren’t seriously injured in the end. A smartphone wouldn’t make an explosion like car blowing up. Even 100 smartphones. If smartphones were like grenades then that would be the weapon of choice for terrorists. Can’t help but wonder if an anti-semitic person “spiked” the gasoline or hid a 5 gallon canister inside since it’s hard to imagine even a lot of fuel doing so much damage r”l. Explosion was caused from too much petrol, not from a smartphone. The smartphone had no battery in. A local bochur poured in whole petrol can in to the fire. 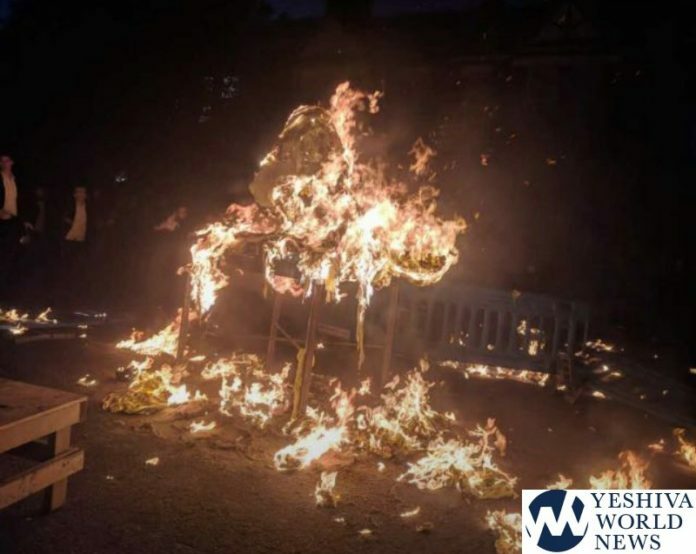 As soon as the Rebbe lit the stick to light the fire, a spark just touched the actual fire and the petrol caused the whole fire to ignite and explode. 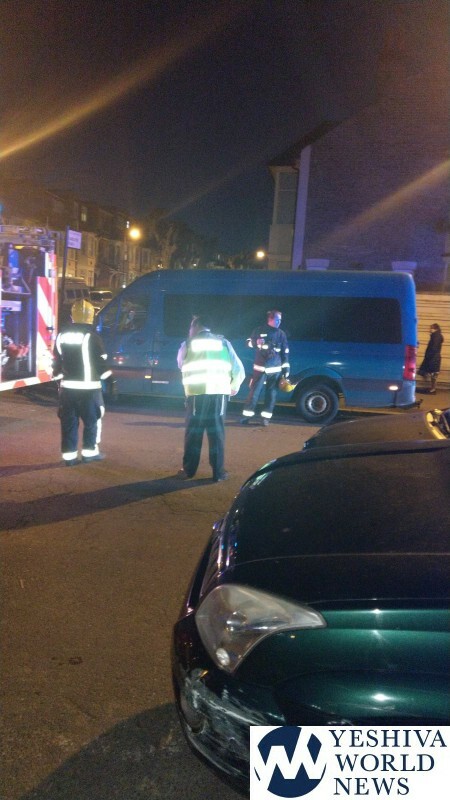 Hatzola treated 30 children, 2 were taken to hospital, one for burns, the other with a broken arm. The others had minor slight burns and injuries, and many treated for shock and trauma. Police and Fire Department have started investigations. first of all, shut the music. pple were hurt. stop the celebration at least until there are no more injured. Apparently there were also deodorant bottles placed there so that could have caused the explosion to abrupt so quickly but I somehow doubt it because I’ve seen them being placed in fire way hotter than that and it took longer than that to explode and fuel on its own doesn’t explode the way that it did I presume the fuel caused the phone battery to explode straight away which caused the big explosion. The ultimate accolade that Yeshivah World News is THE source for Jewish news is that the BBC news website quotes the news posted by YWN. Kol Hakovod! I was there. I was standing a little back with two small children and I can tell you just how exaggerated and incorrect this article is. there was absolutely no trampling. Yes immediately after people were panicked but realised immediately everything was under control. The music was stopped and every single shaken child or worried mother was helped and pacified. I was extremely impressed with how it was handled. I’d like to add that I saw the children Hatzola were treating. They made an announcement that anyone that is hurt should come into the shul were hatzola will treat them. Every child who thought he/she may be hurt arrived. Bh there were no injuries. It was a true nes. Once again a situation extremely well managed. Thank you biala london. “hendoner” , I think this is also a good opportunity to note that since obviously goyim, and goyish agencies look at YWN, making it very important for us to be very careful about what we write in these comments sections to make sure not to be mechalel Sheim Shomaym C”V. Maybe it’s time for us to learn a little science and have some awareness of the environment, instead of destroying Hashem’s world. Deoderant cannisters don’t belong with fire. Ignorance and stupidity is not the Jewish way.